The original Nidhogg is a fine example of a mechanically perfect game. 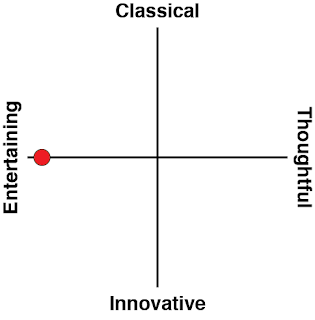 That doesn’t mean it’s 5/5 stars, but it does mean that I can’t imagine how the gameplay could be improved by adding or taking away any mechanics – the unique interplay of fencing, platforming and tug-of-war style competition crafted by Messhof was frenetic yet fair and great for parties. It’s naturally daunting to think of a sequel to a game which can’t really be improved on, but that hasn’t stopped Nidhogg 2 from hitting PC and PS4 earlier this week. The biggest and most immediately obvious change is the graphical style. While the original game favoured rotoscoped characters on a surreal, pixelated background, Nidhogg 2 brings artist Toby Dixon aboard to bring the game’s grotesque story to life. Nidhogg was always a fairly dark game – it’s about a bloody duel to the death for the right to be eaten by an enormous fleshy dragon god – but Dixon’s art style really brings about the reality of Messhof’s grim universe. Unfortunately, despite the extra effort spent on visual storytelling, Nidhogg 2 does not feature a story mode and its narrative remains spartan. Furthermore, for the players who are here for the gameplay, the new visuals can prove a tad distracting. There’s a lot more moving components, more bright colours and character models which can be customised, but all of these lead to visual noise which can obstruct gameplay. The stick figures of the original Nidhogg clearly reflected what the player’s current state, whether running, stabbing or dying, but Nidhogg 2’s characters are harder to read. There’s also an issue of the violence; the original Nidhogg was fairly violent but in a pixelated, abstracted way. 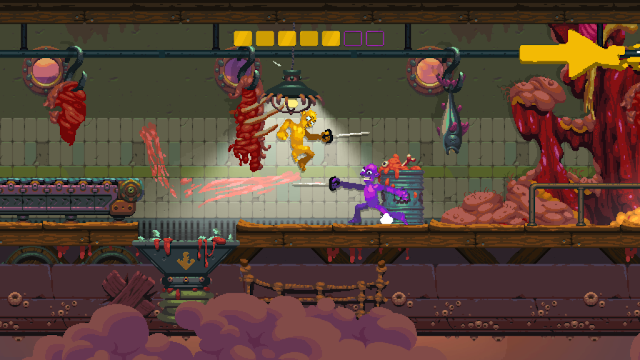 Nidhogg 2 on the other hand falls deep into the realm of stylised violence – the permanently bloodstained floors remain, but now players also watch the pained faces of their characters before they explode into gibs upon death. It’ll put a dampener on the party for anyone squeamish. Thankfully the music has also received an upgrade and it’s undeniably for the better. 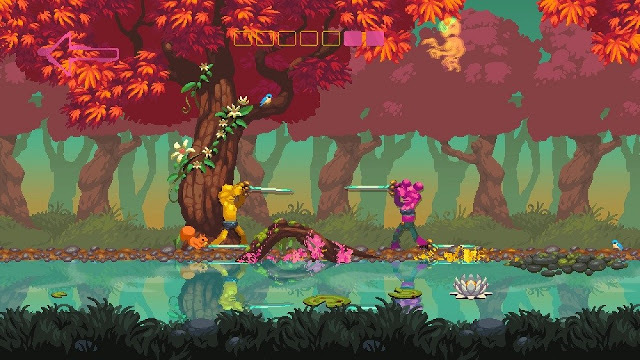 Nidhogg 2 is set to subdued, electronic beats that are quite catchy. It fits well with the game’s overall slowed down pace and colourful, surreal atmosphere. There’s also a lot of in game cosmetics which sync up to the music, making the game feel like one giant delightful trip. Looking at gameplay changes now, the addition of weapon types is sure to shake up the metagame. In addition to the classic Nidhogg rapier, the sequel adds a wide-swinging broadsword which proves trouble for aerial players, and a dagger which lacks in defence but is deadly when thrown. There’s also a bow and just… it’s a bow; more on that later. Each time you respawn you’ll have a different weapon, but it’s determined by a cycle and not by randomness. Variety in weapons leads to new matchups and more strategic combat – the best players will be able to adapt to the strengths of their weapon and change their playstyle to surprise opponents. The broadsword and knife are well balanced with distinct pros and cons compared to the original rapier, and are intuitive to use. And then there’s the bow. The addition of the bow and arrow has proved to be incredibly divisive among fans of the original game, and I myself still can’t quite decide whether it’s a good idea or not. The bow takes a few frames to charge up, so sometimes you won’t be sure that you’ll actually fire an arrow if you’re used to tapping the attack button. Its arrows are also automatically deflected by stationary swords, and deflected arrows get flipped horizontally before hurtling back at you with speed – all this means the bow is [i]abysmal[/i] at close range fights. From a distance, however, the bow is great at sniping players who aren’t careful with their jumps and rolls. The bow’s addition disrupts the game dramatically. New players to the game will likely fumble and get themselves killed using it, but experienced players can prevent their opponents from getting close enough to attack through effective arrow fire. Other motions have been subtly returned and revamped for the sequel as well. You can now kick swords out of an opponent’s hands while unarmed if you time it well, and attacking while an opponent rolls beneath you now kills them instantly. Unarmed fighting is a lot more powerful and aggressive, while swords have been tuned to be more defensive. Flung swords are deflected if the spinning sword touches any part of an opponent’s blade, taking a flashy and entertaining comeback move from the first game and making it largely impractical in the second. Everything is also slowed down a little bit – it discourages button mashing and forces players to appreciate the high/medium/low sword stance system, but half the draw of the first Nidhogg was being able to win simply by being a more energetic player than your opponent. In Nidhogg 2, victories are more strategic and rely on adapting to the strengths and weaknesses of each weapon. This has the awful side effect of taking a base game which was prone to stalemating (perhaps the only bad thing about Nidhogg 1) and exacerbating the problem: 5 minutes feels like a long round in Nidhogg 1 but the sequel doesn’t shy away from 10+ minute games if both players are evenly matched. 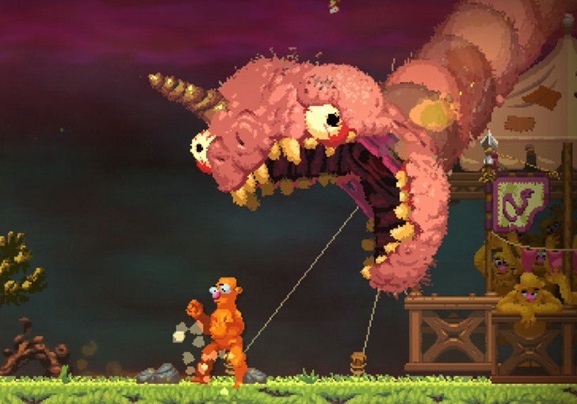 Nidhogg 2 is a worse party game thanks to these changes, but it rises a few notches for competitive viability. The additional game mechanics opens up a wealth of strategic decisions, and the greater variety of stages ensures that tournaments will be more entertaining. It’s still best experienced as a couch-multiplayer game but online play is there – I didn’t have trouble finding a match but for a game this focused on precise timing the online framework just couldn’t keep up consistently. There’s still a fight-game style arcade mode as well but the AI is exploitable in some aspects and straight up cheats in others. Whereas the original Nidhogg was a wickedly fast and immediately loveable party game, Nidhogg 2 pushes the boundaries and arrives with mixed results. Its design choices inject some more strategy to the run-and-stab gameplay, but the increased complexity and love-it-or-hate-it art style makes it a harder game to recommend for casual players. I did warm up to the changes after extended play and if this is the direction Messhof wanted to take its game then I can appreciate it for what it is. 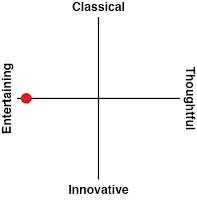 That being said, I think in the long run I’d find myself preferring the simple elegance of the original.